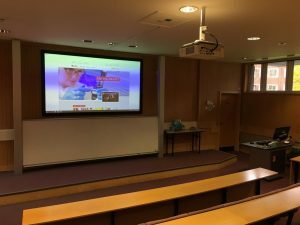 We are very pleased to report that the AV upgrade of the Meteorology Lecture Theatre in GU01 has been completed. The equipment consists of a larger screen with laser projector, one of our new standard tech tables with control panel, adjustable interactive monitor, lapel microphone, document camera, and cable tidy comprising HDMI/VGA/audio. We hope you will agree that this provides a much improved audio and video experience in this teaching space.